Bloody Marys are the most dynamic of cocktails. Not only are they one of the most classic drinks around, they can also double as an appetizer. Quench your thirst—and your appetite—at these 10 best places for a Bloody Mary in Mississippi. The Bistro Bloody Mary at the upscale French Eatery is truly a work of art. Vodka and Bloody Mary mix come together with lemon, lime, and sriracha. To top it off, you'll enjoy a hearty combination of blue cheese, bacon, okra, asparagus, and stuffed olives decorating your glass. Here’s the thing: anyone can make a Bloody Mary, but Shaggy’s spices up this traditional favorite with optional Sirachi vokda. You get an extra kick with every sip, plus a few extra flavors that make a Bloody Mary here unique. Sundays are the best for Shaggy’s Bloody Marys—they’re just $5, all day long. 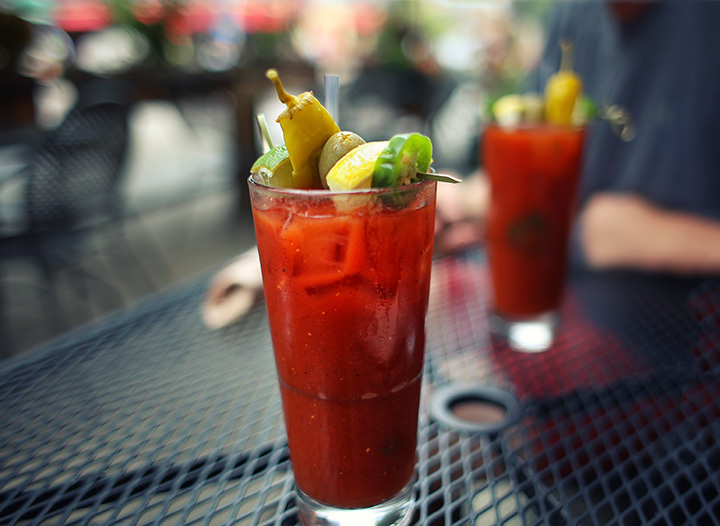 There are two reasons why a Bloody Mary at 303 Jefferson makes sense: first, they’re delicious. And second, 303 Jefferson is part of the Olde Towne Leisure and Recreation District, so you can take your Bloody Mary to go wherever you roam within the ordinance. Best of all, they're Bloody Mary includes a special fan favorite garnish—bacon! They don't give much away on their menu about their signature Bloody Mary, but don't let that stop you from ordering one. This large-and-in-charge beverage comes fully loaded and perfectly garnished to give you some of the best flavors you'll ever experience in a Bloody Mary. To spice up the deal, this place also has some of the best food in town. Free locations to choose from, the Bloody Marys here look almost too good to drink. Bloody Marys have become somewhat of a fashion statement, but this place retains the drink’s original roots by keeping garnishes to a minimum while making them look ever so appealing. The food here is utterly Exquisite, and the Bloody Mary makes the perfect addition to any meal. This three-location restaurant uses authentic Mississippi-made vodka for its Bloody Marys. Their food menu leaves you wanting for nothing, and can please even the pickiest of appetites. Combine your meal with a bloody Mary and you've got a winning experience. The sports-themed restaurant has the greatest Hail Mary you'll ever see. You can grab one of their signature Bloody Marys for just five bucks or upgrade to the super-sized fish bowl for an extra $10. What's in their secret sauce? It's fire water vodka. If you're brunching at Old Fannin restaurant you need a Bloody Mary on your side. It's the only way to do brunch right. The service is quick, the prices are fair, and the portions are large. Brunch just doesn’t get any better. The only thing that comes close to the Bloody Marys here is the view. This elevated steak and seafood eatery offers waterfront dining and an extensive bar to give you whatever flavor you're craving. It's a great place to watch the sunset from their patio with an ice-cold Bloody Mary in your hand. Weidman's is one of the oldest restaurant in Mississippi, with roots dating back all the way to 1870. One of the best things about their brunch menu is there Bloody Marys. At just $4.50, their Bloody Marys are the perfect combination of quality and value.